In case you haven't noticed, I get very excited when I read about women flooring retailers. 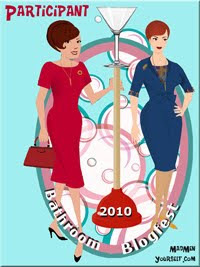 In fact, the impetus for my first post on this blog - Women Of Flooring America Making Their Mark - came from an article about women retailers. Now, for the record, it's not that I don't appreciate men retailers. There are a lot of really inspiring and talented men retailers out there. And I blog about them [e.g., Tony Schiano, Michael Cape, Jack Mitchell, or Dan Bane]. It's just that I really, really like reading about women retailers transforming the retail shopping experience, particularly in flooring. Take Tracy and Renee Gardner from Gardner's Flooring America or Suzanne Brown from Dobson Floors. 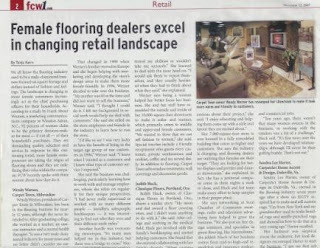 This time, the article is titled "Female flooring dealers excel in changing retail landscape" by Tanja Kern from the November 12, 2007 issue of FCW. Quoting research from Frank About Women, the article reminds us that women are our customers ["92 percent of women claim to be the primary decision-makers for most - if not all - of their household's purchases."] and they absolutely demand the best quality, the right selection and attentive service. 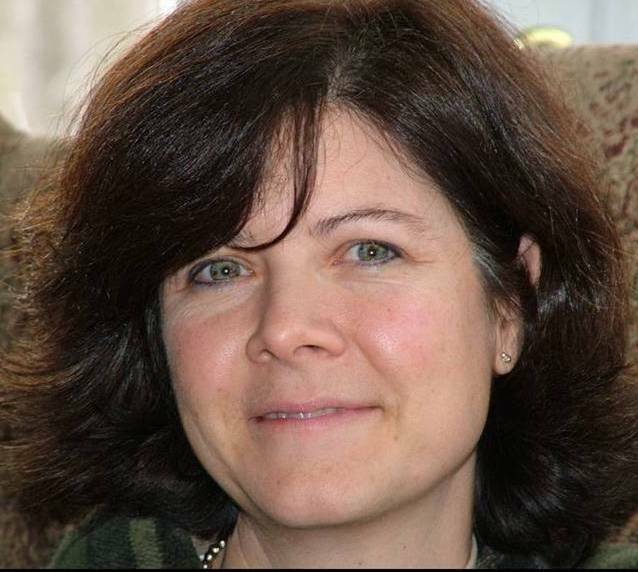 + Wendy Werner from Carpet Town in Milwaukee, WI: "... Werner says being a woman helped her better focus her business. She and her staff have remodeled the outside and the inside of her 10,000 square-foot showroom to make it softer and warmer, which caters to middle and upper-end female customers. 'We wanted to show we can sell fashion to women,' she said. Special touches include a friendly receptionist who greets every customer, private workstations and cookies, coffee and tea served daily..."
+ Judith Huck, Classique Floors in Portland, OR -- also mentioned in my inaugural post. "...Her 7,000 square-foot store is now housed in a fully remodeled building that caters to higher end customers. She says the industry is changing, and flooring dealers are realizing that females are their target. 'They are looking for better displays and prettier and cleaner showrooms,' she explained. In fact, she has a janitorial company come in three nights a week to clean, and Huck and her team make every effort to keep samples in their proper place." + Sandra Lee Harter, CarpetArt Home Accent & Design in Daleville, VA. Creating custom rugs inspired her to start the business. With New York chutzpah, she has grown the business. Here, here! (and there and there) Thank you for sharing this info. It demonstrates two things A) it takes one to know one - women store owners know what women consumers like. B) What works for women, works for business at large. Mary, thank you for amplifying and elevating this conversation over at http://inwomenwetrust.typepad.com/in_women_we_trust/. The more women get actively involved in creating retail experiences, the more all consumers will benefit.